Conondale is a town in the Sunshine Coast, Queensland hinterland region of Queensland, Australia. 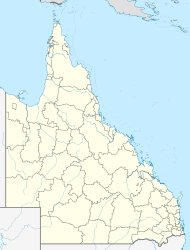 The town is located in the Sunshine Coast Region local government area and on the banks of the upper Mary River, 114 kilometres (71 mi) north of the state capital, Brisbane. At the 2016 census, the locality of Conondale, which includes the surrounding area, had a population of 858. Conondale is home to the Crystal Waters ecovillage which provides accommodation for 200 residents. It was established formally in 1987 making it one of the first in Australia. Conondale Post Office opened by 1949 (a receiving office or Telegraph office had been open from 1904) and closed in 1974. The Sunshine Coast Regional Council operates a mobile library service which visits the at the school on Maleny-Kenilworth Road. Wikimedia Commons has media related to Conondale, Queensland. ^ a b Australian Bureau of Statistics (27 June 2017). "Conondale (State Suburb)". 2016 Census QuickStats. Retrieved 12 January 2019. ^ "The village people". Green Lifestyle. nextmedia. 26 September 2012. Retrieved 21 February 2016. ^ "Conondale Timbers Sawmill (entry 602689)". Queensland Heritage Register. Queensland Heritage Council. Retrieved 14 July 2013.